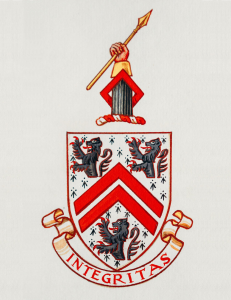 In 1939, the English Heraldic Authority granted a coat of arms to Joseph Edward Davies featuring lions, chevrons, a hand holding a spear, and a scroll with the word “INTEGRITAS” (Latin for Integrity, obviously). Davies was the third husband of Majorie Merriweather Post, a philanthropist, socialite, and owner of the Post Cereal Company after her father’s death in 1895. She was the wealthiest woman in the United States for some time, and commissioned a lavish estate in Palm Beach, Florida. The 126-room, 110,000-square-foot home was willed to the National Park Service upon her death in 1973, in the hopes that it would be used for state visits or as a retreat for US Presidents. A “winter White House” of sorts. The NPS was sadly unable to maintain the property, and in 1981 it was returned to the Post Foundation by an act of Congress. The Post Foundation put the property up for sale, and it was purchased in 1985 by a real estate speculator and businessman, who turned the estate into a members-only club and resort, then turning the management of the property over to his wife (interestingly, this owner would also eventually have three spouses). He also took a liking to the coat of arms granted to the original owner’s husband, appropriating it for himself against the rules of the English Heraldic Authority. Before deploying it as his own, he replaced the word “INTEGRITAS” with his own last name. Ironically, Post’s home, named “Mar-a-Lago” (Spanish for “Sea-to-Lake”) eventually served the function she had hoped it would serve, when the estate’s new owner was elected President of the United States in 2016 and immediately began using it as a Presidential retreat. Also ironically, the man who stole a coat of arms and replaced the word “integrity” on it with his own name is now embroiled in one of the most conspicuously fraught combinations of scandals in US presidential history. It gets more interesting. 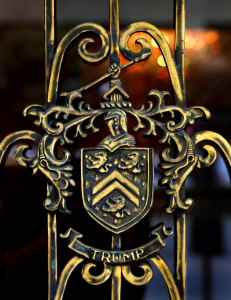 When Donald Trump tried to open a golf club in Scotland using the coat of arms, his application for the trademark was rejected because the coat of arms was not his to use. So, when the club opened in 2012, he instead used a manufactured, unofficial coat of arms. 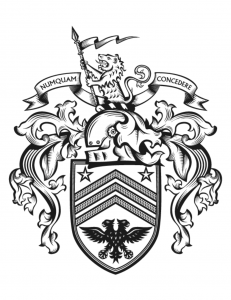 The new version moves the lion to the top of the shield, giving him the spear and the motto “Numquam Concedere” (Latin for “Never Give Up”); it also adds an extra chevron, and includes – I am not making this up – a two-faced eagle. Source for much of the information for this story was this New York Times article.